OUTREACH Max enables network installers to overcome the distance limitations of Ethernet and Power over Ethernet (POE) easily, meaning that IP cameras, wireless access points, and other POE-powered network devices can be located right where they are needed. Note: OUTREACH Max extends network connections to POE-enabled devices only. To extend the range of Ethernet without POE, see Veracity OUTREACH LITE extenders. OUTREACH Max provides an instant solution to this problem. By connecting an OUTREACH Max for every extra 100 metres of cable, both Ethernet and POE can be extended to 200, 300, or even 800 metres (2625 feet). As OUTREACH Max repeats the network connection every 100 metres, quality does not degrade. This means that the full bandwidth of 100BASE-T Ethernet (200Mbit/sec) is maintained, even over 800 metre runs. This is essential for assured transparency and predictability. A single OUTREACH Max doubles the cable range to a POE IP Camera. Each cable segment can be up to 100 metres. OUTREACH Max Ethernet extenders are ideal for IP video applications, as they eliminate the one disadvantage that network cameras have compared to older analogue cameras: the limited cable length. As POE is becoming universal in digital video installations, Cat 5 cable extension is as simple as connecting an OUTREACH Max wherever it is needed. OUTREACH Max can also be used to upgrade legacy twisted-pair video installations to IP with POE, where the Cat 5 infrastructure for a network is already in place, but run lengths exceed the 100 meter limit for Ethernet. PTZ cameras, heater/blower units and door interlocks are all examples of products that are adopting the extended-power POE Plus standard that OUTREACH Max also supports. Wireless networking Like IP cameras, wireless access points (WAPs) are ideally suited to POE as they must be positioned optimally in locations that are often inaccessible or remote. Using OUTREACH Max, a WAP - or Bluetooth access point or RFID reader - can be located just where it is needed for optimal coverage. High-power radios and 802.11n APs can take advantage of the POE Plus power which OUTREACH Max supports. 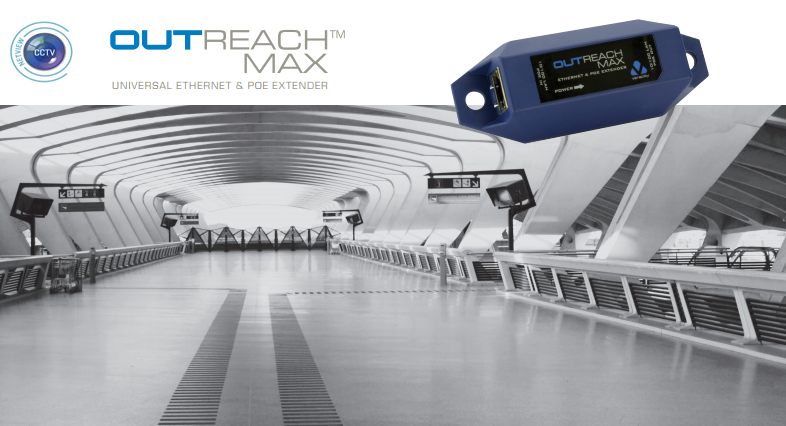 OUTREACH Max can be used in combination with OUTREACH Lite to extend networks without POE from 300 meters to over 2 kilometers.